2017 marks 150 years since Joseph Lister published his ground-breaking article “Antiseptic Principle of the Practice of Surgery” in the medical journal, The Lancet. 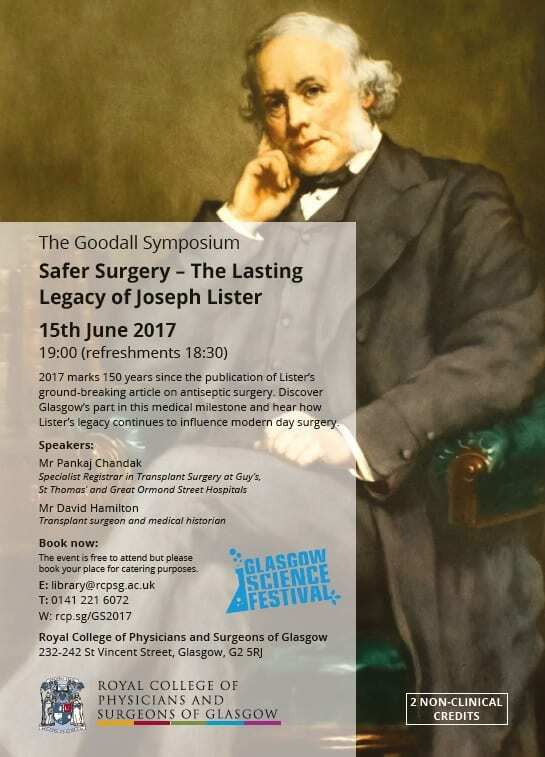 To mark this occasion our annual Goodall Symposium will be celebrating Joseph Lister and his outstanding contribution to antiseptic surgery. There is, arguably, no more appropriate place to celebrate the beginnings of antiseptic surgery than in Glasgow as it was in Glasgow Royal Infirmary that Lister first started using carbolic as an antiseptic, heralding the beginnings of a surgical revolution. Based on Louis Pasteur’s research into fermentation, Lister began covering wounds in dressings containing carbolic acid which was known to prevent putrefaction in substances of animal origin. His first attempt was a failure but with his second patient, an eleven year old boy, Lister succeeded. As part of the patients treatment, pure carbolic acid on calico was applied to all areas of the wound – the wound healed; there was no infection, no gangrene and so amputation was avoided. 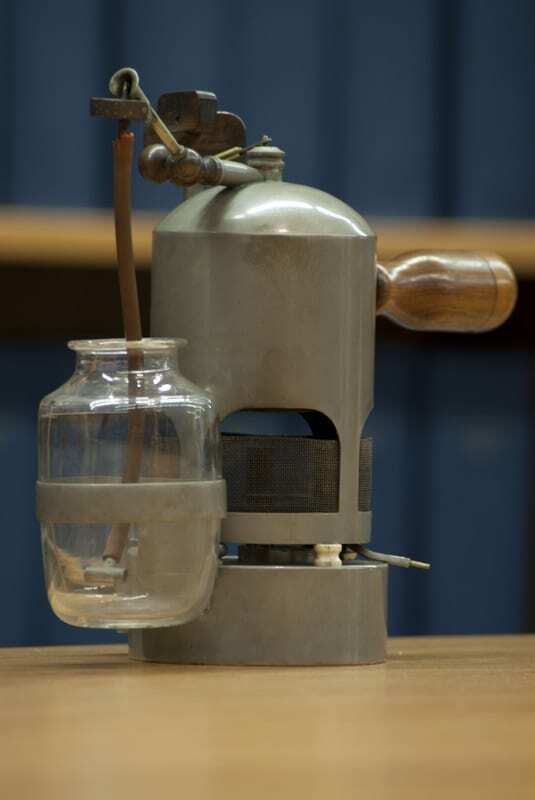 Lister continued to expand his use of carbolic acid using a steam spray (pictured below) to spray the air in his operating theatre. He was particularly driven by his intense revulsion towards the conditions of the surgical rooms and wards at Glasgow Royal Infirmary and devoted his full attention to reducing cross infection. Poor sanitation in 19th century hospitals meant patients were at serious risk of contracting diseases such as pyaemia, gangrene and tetanus. Lister was constantly battling with the managers of the Glasgow Royal Infirmary over the poor conditions of the wards and in 1870 wrote a letter to the Lancet entitled On the effects of the antiseptic treatment upon the salubrity of a surgical hospital, where he described the wards at the Royal as “some of the most unhealthy in the Kingdom”. The wards had been built over cholera burial pits and were close to the pauper burial pits at Glasgow cathedral. 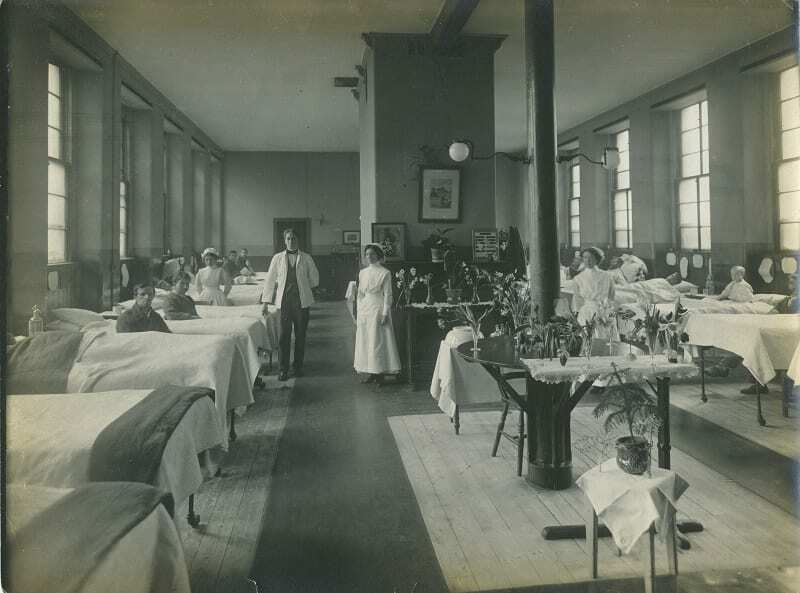 Lister also stated that the wards had not been properly cleaned for three years and were dreadfully overcrowded. Lister’s success with antiseptic procedures revolutionised the treatment of disease and injuries. Join us to celebrate 150 years of safer surgery! Setting the context of Lister’s 1867 article is Mr David Hamilton, transplant surgeon, medical historian, and author of the classic text The Healers: a History of Medicine in Scotland. Our Goodall Symposium takes place on the 15th June 2017. To book contact library@rcpsg.ac.uk or call 0141 221 6072. Our Goodall Symposium is part of the Glasgow Science Festival 2017.